Size male: 38 - 41,5 mm. Size female: 42 - 50 mm. Native to Venezuela. The distribution of Atelopus soranoi is very reduced. This species is known from a single stream in an isolated cloud forest, the Paramito de San Francisco, near the town of Guaraque, in Mérida State, Cordillera de Mérida, in Venezuela. It has the most restricted geographic range of any Venezuelan Atelopus species, and lives at an altitude of 2,400-2,718m asl. If you have records of Atelopus sorianoi from a later date, or photos of the species or habitat, please let us know. This species is known from a single location along a stream in an isolated cloud forest, the Paramito de San Francisco, near the town of Guaraque, in Mérida State, Cordillera de Mérida, in Venezuela. The small range of this species does not include any protected areas. 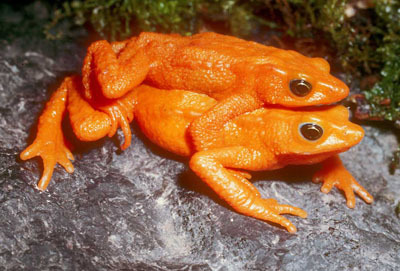 Surveys are needed to establish whether or not this species still survives, and a project aimed at evaluating their population status and at assessing environmental and climate conditions of the cloud forests of Mérida State in the Venezuelan Andes (where populations of this toad might occur in remote ridges and valleys) has been initiated. Ex-situ conservation action might also be required, but for being able to do this it's needed to find surviving individuals of the species. Infection with Batrachochytrium dendrobatidis in this species was reported by Lampo et al. (2006). Local climate data indicate that one of the most severe dry seasons recorded in the region since 1970 coincided with epidemic events. In addition, clear cutting has greatly reduced the amount of available habitat for this species. Atelopus sorianoi is critically endangered and very possibly extinct. La Marca, E. 1983. A new frog of the genus Atelopus (Anura: Bufonidae) from a Venezuelan cloud forest. Milwaukee Public Museum Contributions in Biology and Geology: 1-12. Enrique La Marca, Argelia Rodríguez, Juan Elías García-Pérez 2010. Atelopus sorianoi. The IUCN Red List of Threatened Species. Version 2015.2. <www.iucnredlist.org>.